A hover fly feeds on a wild flower. Those little stubby antennae are your first clue that this is not a bee, but rather a benign (read: stingless, biteless) hover fly. Not that bees aren’t very benign (they are for the most part! ), but people often confuse these flies for bees. Which of course is the point, my tricksy hobbitses. 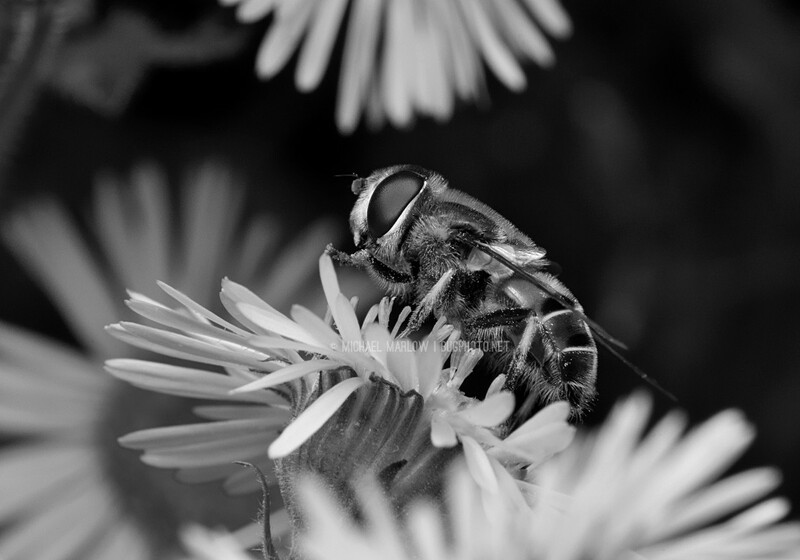 Posted in Hover FliesTagged black and white photography, drone fly, honeybee mimic, hover fly, insect photography, mimicry, monochrome, SyrphidaeBookmark the permalink. 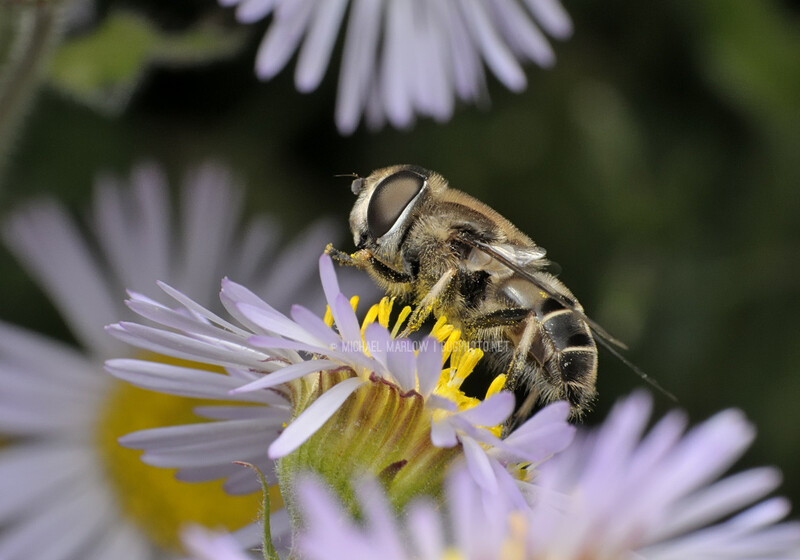 In the UK, the common name ‘drone fly’ is usually attributed to Eristalis tenax as it is though it is a good mimic of the honey bee Apis mellifera. However, there are 10 British species some of which are passable bumblebee and solitary bee mimics although others are less convincing. The genera have a loop in vein R4+5 and a petiole beyond the junctions of veins R1 and R2+3. The larvae are the ‘rat-tailed’ maggots often found in ponds, ditches etc. Thanks for the info, Marc. I believe in the US, “drone fly” refers to the same, Eristalis tenax, specifically. I feel like I’ve seen other flies casually referred to as the same but I could be wrong. Unfortunately I don’t have the shots to verify wing venation. Those larvae sound interesting though. I’ll have to look them up. I’m not sure if you get Eristalis pertinax, this is sometimes called the tapered drone fly. I don’t think we have that one; at least it doesn’t seem to be on bugguide.net which is probably the best site for identifying North American insects, spiders, etc al.